Steve Little (Eastbound & Down) stars as Father William, a nonsense-babbling manchild of a priest who spends his catechism study time watching vacuous YouTube videos. He’s given time off to ponder his true vocation, which he does in the company of his sister’s ex-boyfriend from high school, Robbie (Robert Longstreet, Septien). The spotlight operating schlub that accompanies William isn’t the poetic heavy metal musician that he remembers, but the two make fast, if slightly awkward, friends and are soon off on a frightening, tension-filled canoe trip that brings them face-to-face with Harajuku-like Japanese tourists, an intimidating silent sinner filled with regret, and possibly the Devil himself. Writer/director Todd Rohal (The Guatemalan Handshake) has created an unforgivably unique piece of cinema that’s filled with morally empty detours, clever metatextualizing, and a variety of affectingly uncomfortable yet strangely endearing shifts in tone. It all adds up to one of the most memorable indie films of recent years, at least for us adventurous types. The audio commentary features Rohal, Longstreet, and Little, the latter of which remains noticeably quiet throughout. They discuss their favorite audience questions from screening Q&A’s, choice DVD commentary tracks, the brilliant (and inspirational) Funky Forest: The First Contact, and how Rohal refuses to understand why some viewers fail to grasp the blatant simplicity of the film. The highlight comes when they point out something in the background of a shot that I missed during not one, but two viewings of the film…creepy stuff. Also included is the appropriately titled short film Sasquatch Birth Journal 2 by David Zellner, which you’ve probably seen by now if you’ve attended any sort of genre programming at a film festival over the course of the past year. It’s worthy of five minutes of your time in any event. The disc is rounded out by the U.S. and Japanese trailers (the foreign spot captures the film much more accurately than the domestic one, which makes the film seem like a standard indie-minded buddy comedy) and a gag-filled outtake reel filled with failed improvisations as well as a canoe tipping. 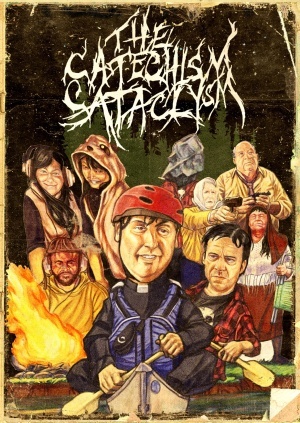 The Catechism Cataclysm debuts on DVD today courtesy of IFC Films.